A new and very unique wireless smartphone charger has been created by AR Designs based in Toronto Canada called the OvRcharge. What makes the OvRcharge different to other wireless smartphone chargers is that your mobile phone is suspended in midair whilst charging takes place. The levitating wireless charger has launched via Kickstarter and is close to raising the CAD$40,000 it requires to go into production. Watch the video below to learn more about its inspiration and unique levitating technology. The developers of OvRcharge explain more about its design and magnetic levitation. Wireless power transfer is around for years, wireless energy transmitted to electrical load from a base or transmitter. Energy is sent through waves and on other end an inductive coupling to electrical device, which can then use that energy to charge batteries or run the device. There are some drawbacks are in this technology like power loss and distance limitations but still that’s enough for the magic. Magnetic levitation or magnetic suspension is a method by which an object is suspended in the air with no support other than invisible magnetic fields. Magnetic force is used to counteract the effects of the gravitational acceleration and any other accelerations. 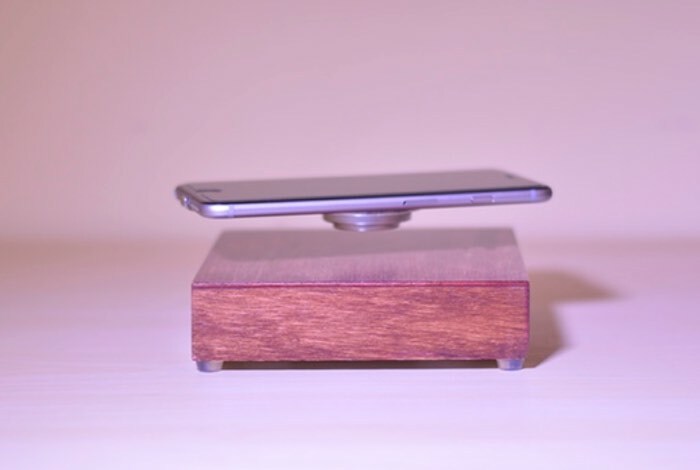 The levitating wireless smartphone charger is now available to back my Kickstarter with pledges starting from CAD$199. For full specifications and pledges jump over to Kickstarter via the link below.